I know how difficult it is for every beginning guitar player out there just trying by himself. However, you do not have to struggle on your own - I would like to recommend you a website, where teachers are dedicated to teaching you - JamPlay.com. It happens all online, you don't have to be travelling anywhere. Just stay at home with your guitar but interact with teachers and others as if you were at the actual lesson! 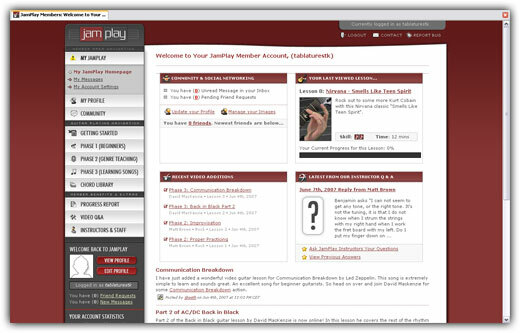 JamPlay.com is hitting it big in the guitar world. Their website is a membership service which broadcasts high-definition video guitar lessons. They have brought together guitar instruction with interactivity... even allowing you to ask questions to their video instructors. They feature 4-5 guitar instructors to give you a selection in teaching methods, which is a big plus. They teach by "lesson set" instead of just flopping out a ton of small video clips. They start with the very basics like tuning your guitar, finger placement, and basic chords, and move on to finger-picking, palm muting, hammer ons, pull offs, and many more advanced topics as you progress through the lessons. I find systematic teaching very important since you get much better results within shorter time and the great thing is, it's also cheap because they get quite a few members. I have tried it myself, to see what's going on there, but I just couldn't resist picking up my own guitar and jam and learn with the teacher on-line. Thewebsite itself is very neat, I made some screens for you. This is the screen right after you log in, where you have access to all of the features you want to use, or simply continue the last lesson. Just try it yourself at jamplay.com, you can click the image below. PS: inform us about your progress in the discussion! Written by Rado on 2007-07-01 and read 74931 times. Its really good to know more information about guitars. 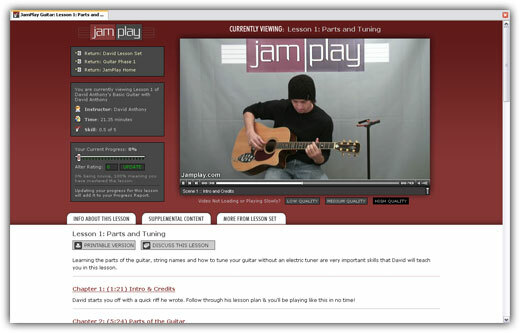 Really online learning helps a lot of people learn guitar easily without wasting time. Those who are really intrsted can learn playing guitar at home easily. The websites are providing good video sessions of how to use guitars starting from the scratch. hi wooow what it IS >>>?? i how can use the original versen?